Last summer I was known at my job for being a baker. I would make cookies and cupcakes. Now that I’m back, but on a different team, I wanted to endear myself to my new co-workers. At the same time I was hoping that being nice would help me get a computer faster and relieve my boredom! 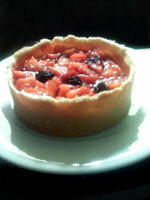 You can make this into little 1 inch pies or do a larger mini tart using a 4 inch spring form pan or pie dish. Mix the flour, butter, salt and sugar in a mental bowl with a fork. Mash in the butter until it forms course meal. Gradually add in the water, you may not need all of it. Mix the dough together till it forms a ball. Pinch off 1-inch balls of the dough and press it out into a flat layer with your hands. 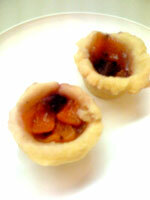 Fill mini muffin tins with the dough, fluting the edges to make mini pie shells. Pre-heat the oven to 375 degrees. Chop the peaches into chunks, about the same size as the blackberries. Mix all of ingredients in a large bowl. Using a spoon, being careful to not pick up too much liquid, fill the pie shells with 3 pieces of peach and 1 blackberry. Cook the pies for about an hour. Once the shells are golden brown, remove from the oven. Let them cool in the tins for 5 minutes then move them to a rack and cool completely.